Taiwan’s government has focused on expanding the island’s PV power generation as part of its plan to abandon nuclear power. 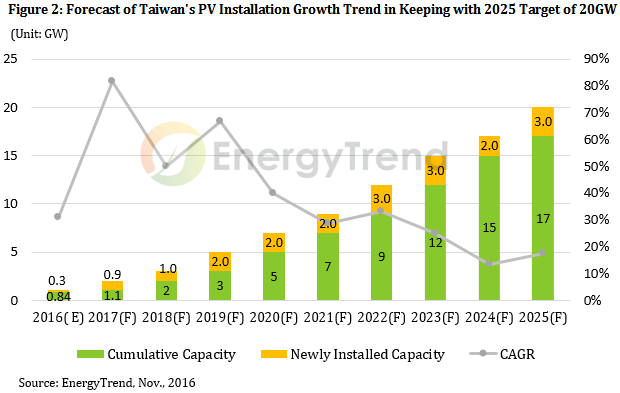 In terms of targets, Taiwan aims to add 1.52GW of PV capacity between mid-2016 and mid-2018 and ultimately achieve a cumulative capacity of 20GW in 2025. 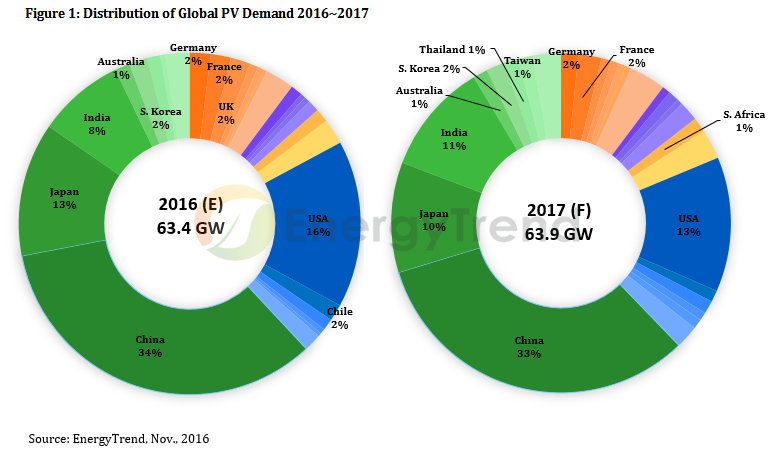 If 1.52GW plan is successfully implemented, Taiwan will be joining Thailand as one of the world’s 10 largest PV markets in 2017 with an annual demand reaching 900MW, according to EnergyTrend, a division of TrendForce. With the global PV demand being almost flat next year, Taiwan is now considered a highly prospective market for major enterprises within the supply chain. One of the major challenges that need to be addressed is the limitations of the local power grids. Taiwan’s Ministry of Economic Affairs has made the expansion of transmission lines and related infrastructures a priority before accelerating the installation of PV systems. With its two-year PV promotion project, the ministry expects 910MW of rooftop PV systems and 610MW of ground-mounted PV systems to be installed before the end of June 2018 (collectively a total of 1.52GW). Additionally, Taiwan’s Bureau of Energy, which is under the Ministry of Economic Affairs, has recently adjusted next year’s FiT rates to favor high-efficiency PV modules. While FiT rates for PV projects in 2017 will be 3~6% lower compared with the rates in 2016, projects that use high-efficiency modules will receive an additional 6% bonus. Therefore, projects that deploy high-efficiency modules will see their 2017 FiT rates matching or exceeding the rates of the prior year. In areas where installations for distributed PV systems are relatively low, such as northern Taiwan and offshore islands, the bonus is even higher at 15%. On the whole, this policy incentive will certainly spur installation of rooftop systems across Taiwan over the next two years.